A GROUNDBREAKING study looking at the impact of a brain training computer game on learning is to be extended across Scotland. Learning and Teaching Scotland, the body responsible for the development of the curriculum and for exploring the use of ICT in education, is to widen its research project looking at the effect of Nintendo's More Brain Training from Dr Kawashima on pupils' maths ability. 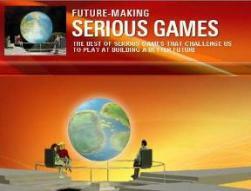 More than 900 pupils and 32 schools across the country will be involved in the project, which will begin in April 2008. A small-scale study carried out with P5-P6 pupils in Dundee's St Columba's Primary School by LTS last year found a daily dose of the computer game helped improve pupils' attainment in maths and their concentration and behaviour levels. The pupils were given a maths test at the beginning and then they used More Brain Training from Dr Kawashima on the Nintendo DS for 20 minutes at the start of each day for 10 weeks. It featured challenges including reading tests, problem-solving exercises and memory puzzles designed to exercise the brain. 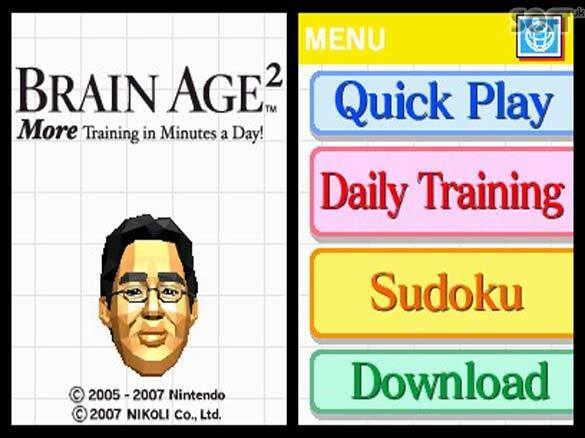 More Brain Training from Dr Kawashima uses the same format as its predecessor. 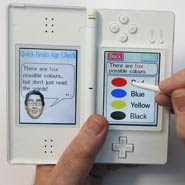 Held like a book, you are invited to use the unique and intuitive touch screen and microphone features of the Nintendo DS as you take 5 - 10 minutes a day to help your brain stay active with challenging new exercises. All exercises contained in the software are based on easy to execute mathematical, cognitive and language-based tasks. The DS Brain Age Check measures the speed and accuracy with which you perform simple tasks to establish your DS Brain Age. They were then tested again and the results showed a 10% average increase compared to before the experiment. The average time taken to complete the tests also dropped from 17 minutes to 13 minutes and 19 seconds. Some children halved the time it took to complete the test while maintaining or improving their score. There was also a notable improvement in the pupils' behaviour and concentration during the study. Children from St Columbia’s primary school played Dr Kawashima’s More Brain Training game on a Nintendo DS console every morning before lessons started. LTS is now working with Her Majesty's Inspectorate of Education and the University of Dundee to carry out a larger pilot of the scheme.Sixteen schools will use the game every morning while another 16 will act as the control group. Derek Robertson, LTS Development Officer for games-based learning, said: 'LTS is committed to exploring and developing new technology to support learning and teaching in the 21st century. Game-based learning can provide dynamic and culturally relevant contexts that engage, motivate and challenge today's young learner. The initial pilot project that used the Nintendo DS and Dr Kawashima produced fascinating results. Not only was there a marked and significant improvement in attainment in mental maths but there was also an improvement in concentration levels, behaviour and self-regulation in the learning process. It will be interesting to see how this applies on a larger scale. LTS and Scotland are at the cutting edge of games-based learning in education, with educationalists in Italy, USA, Singapore and Germany interested in the findings of the project. The study will start in April and run to June. Authorities taking part in the pilot are Dundee, East Ayrshire, Aberdeenshire and the Western Isles. 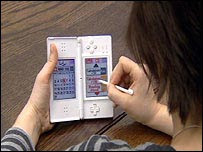 Nintendo DS consoles are already used in Japan as an aid to teaching children the “alphabet” of more than 2,000 Kanji characters. Primary school children are each given a device and provided with software that tests their ability to remember the characters and write them correctly on the lower screen. 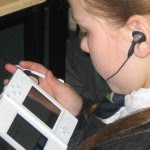 Schools that have started using the consoles – devoting about 20 minutes at the beginning of each “koku-go” (Japanese) lesson to the tests – report substantially higher test scores when the children take mainstream exams. A few mathematics teachers in Japan’s high-intensity cram schools have adopted the Nintendo DS as a way of testing mental arithmetic speed. The Japanese games software industry has responded quickly to the growing demand, churning out dozens of titles that could practically be used by teachers, though the Ministry of Education has been slow to endorse national adoption of the idea. 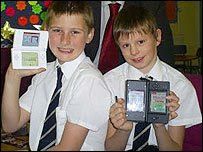 In Scotland, LTS said it was providing 480 Nintendo DS consoles for the project, with 30 going to each school. They will remain in the schools during the trial. Once the scheme is over, LTS will use the consoles for other educational projects over the next few years. The Scottish experiment follows research in England that suggests that many state schools are failing to get the most out of new technology in the classroom. Research from Becta, the Government’s adviser on IT in schools, found that although schools were spending £1 billion on cutting-edge information technology a year, 80 per cent of them were failing to make full use of it. The research also found that many teachers were intimidated by the equipment and struggle to cope, and that children have a better understanding of how it works. The Government is determined to make every child computer-literate, but the research from Becta (formerly the British Educational Communications and Technology Agency) suggested that some schools were buying the wrong software, and support was often amateurish. LTS's Consolarium – the Scottish Center for Games and Learning -explores the range of games technologies available, looking at how they can have a positive influence on education. The Consolarium is designed as a showcase for the educational potential of computer games and has a wide range of consoles (including handhelds) and games, which educators can see and use. 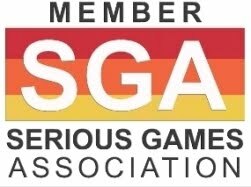 It offers teachers and others involved in education the opportunity to get hands-on access to resources and to discuss the place of games in their class, school or local authority. Learning and Teaching Scotland is an executive non-departmental public body sponsored by the Scottish Government. LTS is the main organisation for the development and support of the Scottish curriculum and is at the heart of all major developments in Scottish education, moving education forward with its partners. Learning and Teaching Scotland was created in 2000 from the merger of the Scottish Council for Educational Technology (SCET) and the Scottish Consultative Council on the Curriculum (SCCC). Learning and Teaching Scotland (LTS) is committed to providing world-class teaching and learning experiences for Scotland’s children and young people. As the lead organisation for curriculum development in Scotland, they offer support and guidance to teachers, early years practitioners, schools and education authorities to help improve achievement for all.